A community that has seen decades of intense violence carries a myriad wounds and trauma that need to be healed in order that life could become human. While the community can more easily absorb the violence inflicted from without, the internal violence, its divisiveness, fractured families and guilt are much harder to heal. Healing requires that the truth be told and the victims given the voice to speak it. The local university must be the first place that resists ideological twisting of history to blame exclusively the state and to shut out all voices that challenge the monolithic narrow-nationalist version of blame. 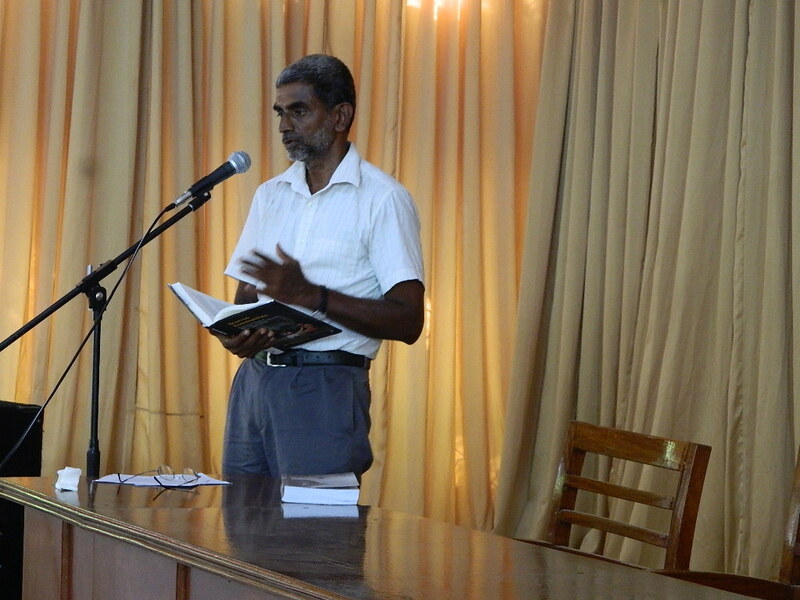 On 24th April 2015, the Jaffna University Science Teachers’ Association (JUSTA) arranged a discussion of the book Palmyra Fallen: From Rajani to War’s End, written by its member Rajan Hoole, in the Library Auditorium. The Vice Chancellor (VC) with the backing of some senior academics banned the discussion. JUSTA was left with no honourable alternative but to defy this blatant attack on academic freedom. The Palmyra Fallen discussion was fixed for the day the Federation of University Teachers’ Association (FUTA) delegation was due in Jaffna to discuss problems of university teachers in the North and East in the morning to be followed by the book discussion in the afternoon. 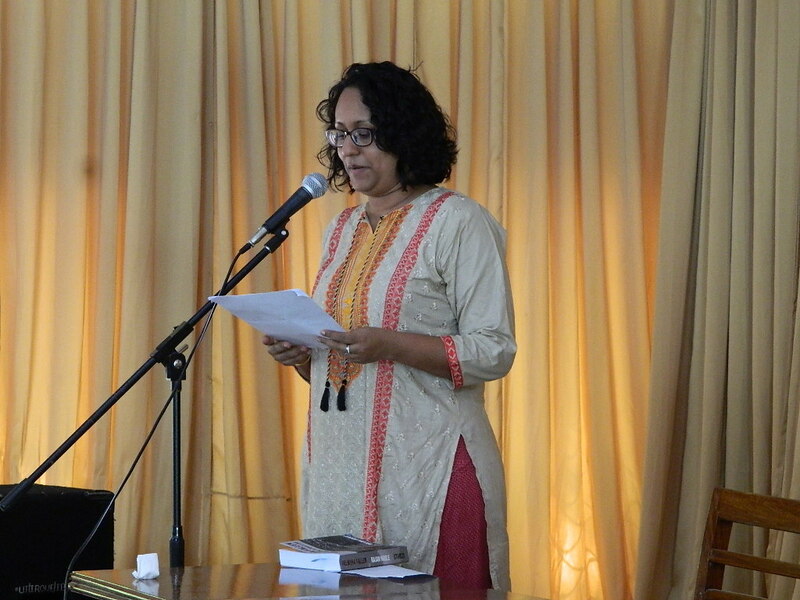 The speakers were Dr. Harini Amarasuriya from the Open University with Prof. Arjuna Parakrama from Peradeniya and Dr. N. Sivapalan and Prof. Daya Somasundaram from Jaffna. The FUTA delegation arrived in Jaffna on the 23rd and independently the organisers of the discussion placed the VC’s notice on Colombo Telegraph and made it known that the book discussion would go on in the University as planned regardless of the ban. Later in the afternoon of 24th April while the book discussion proceeded, the Vice Chancellor was questioned by BBC Tamil Service. She said the ban was requested by the University Teachers Association (UTA) and the University Students Union and was not taken by her, but by the deans’ committee. It was taken, she said, to ensure the smooth functioning of the University and she had no choice when nearly 7500 students and over 400 academics were against it. Asked by the BBC why the book would affect the smooth functioning of the University, the VC said repeatedly that the book was controversial. Asked why it was controversial, she admitted not having read the book, seen a copy or knowing what it was about. The Vice Chancellor’s was a very devious way of deciding unanimity in a very diverse and multi-ethnic body of students and academics. We shall see that the pretext for the decision was a letter by one student leader, and not a committee decision, reflecting canards about politicians from the South coming for the discussion with a sinister agenda and the book being against Tamil nationalism. These had been fed to the students by senior academics close to the VC and recycled back to the VC as a request for the ban. The UTA’s was similarly not a committee decision. After the discussion, albeit strange coming from her, the VC blamed political interference by the Foreign Ministry for the failure of her ban, and not her misguided attempt to stop an academic discussion, which invited worldwide concern. She evidently did not mention the more relevant earlier reprimand by the UGC Chairman and rather than take responsibility when questioned, she took cover by shoving the blame on the ill-used student leader. A grave looking elderly man who came for the book discussion identified himself as the brother of Muruganesan, a promising and creative young intellectual who was tortured and killed in the early 1990s for being caught on the wrong side of the internecine violence that marred the Tamil struggle. To him the event in the University, previously unimaginable, was a release. Since 1990, a strong undercurrent in the University has assiduously suppressed that side of Tamil history dealing with the murderous suppression of dissent and the tragedy of tens of thousands of young misguided or forced into futile sacrifice or fatally disillusioned. However, the University had been a plural space up to the 1980s and in 1986 the scene of the massive public protest when Vijitharan, a student from Batticaloa, was abducted by the LTTE and later killed. Since the militarily and ideologically triumphant Tamil faction took over Jaffna in 1990 the University has been complicit in the brutal suppression of dissent, while advancing rhetorical celebrations of its often hapless ‘martyrs’ and the movement’s heroism. Like Muruganesan, Rajani too had become taboo even though in November 1989 both the University and the public rallied in celebrating Rajani’s life. This is perhaps the reason why Rajani’s portrait is conspicuously absent in the Senior Common Room of the University where the portraits of most who have served and left us are displayed in remembrance. The prevalence of the taboo is witnessed in the refusal of Kailasapathy auditorium for Rajani’s 25th anniversary in September 2014, where the VC told the Hindu that the organisers were ‘troublemakers’ and later, the Senate, that the medical students were against it. In fact the medical students’ union was actively part of the Rajani commemoration committee. Such actions reinforced the atmosphere of intimidation and fear – fear of being branded traitors – that even kept sympathetic academics away from the discussion not only of Palmyra Fallen, but also from the very fruitful discussion conducted by FUTA on overcoming current problems of academics. But both events were a success and of immense benefit to academics and students who came. The open mindedness of the FUTA delegates, who were at pains to tell us that universities in the South too faced similar problems, said one thing clearly. While in the South there is space in the universities for persons who openly oppose Sinhalese chauvinism to be elected leaders in teachers’ unions and to continue their advocacy, in Jaffna there is hardly any room for academics who are similarly critical of the narrow political vision offered by Tamil nationalism to become office bearers of the teachers’ union. The pernicious politics hiding behind the symbols of Tamil narrow-nationalism to deny the students and academics the kind of exposure and independence needed in the real world, exemplifies the state of the University and its deep corruption. Driving away quality was a consequence of war and the totalitarian political dispensation that accompanied it. This exacerbated practices of exclusion of competent applicants that serve to hide mediocrity and rank inadequacy. In post war Jaffna, the University has become the last refuge of a brand of nationalism that has been in many ways destructive. The Jaffna University Science Teachers’ Association has over the last one and a half years documented abuses in academic and non-academic recruitment and demanded an impartial inquiry and early justice for those who were cheated. In short, the administration had become very authoritarian and steeped in power and determined to use that power to obstruct any challenge to arbitrary action. When apparent ambiguity in regulations demanded giving the employee the benefit of the doubt, the administration frequently took adverse decisions ex-parte without discussion with the employee, the unions or even the deans. The system became very vindictive and those who toed the VC’s line had it easy. The others, even deans, could only break their head against the wall. It led to sheer favouritism in the recruitment of academics. The election of the new government in January 2015 led to a flutter in the dovecotes of the administration. All but one of the deans signed a letter to the state minister of higher education, which praised the Vice Chancellor as one whose role was indispensable and excoriated JUSTA’s (though not mentioned by name) complaints as rumours. The letter’s underlying message was to cut a political deal dictated by the change of regime. The deans of management, engineering, medicine and agriculture tried to collar the deans of arts and science, the two regarded undependable, at their homes for their signatures. The former refused. How such control could be used to corrupt and degrade quality in a university, is seen in careful control at every level, starting from the recruitment of young lecturers. Quality is largely sacrificed to loyalty. At the next level the Vice Chancellor appoints heads of departments. In the past it was an easy-going affair, with usually the senior-most person given the headship. Presently the headship carries points for promotion and one has to be a head for election as dean. In the hands of an unscrupulous vice chancellor, the politics of appointing heads becomes a means of tightening authoritarian control, which explains the behaviour of most of our current deans. Ironically the external council members got most of the blame because they were appointed by the erstwhile minister and vice-chancellor’s patron. To be fair, they have many times spoken up to avert some severe abuses, while the deans – the main carriers of the rot – remained silent. The Dean of Arts has paid a heavy price for occasional dissent in pain, heartache and harassment. It is a style of management (indeed we have a Faculty of Management) where those who fall foul of the vice chancellor are harassed with baseless inquiries and tailed by metaphorical Alsatian dogs at public expense. The case of the Librarian who had to bear the stigma for misappropriation and theft without any grounds is given in our records. Rather than promote academic excellence, this dispensation drives people to acute anxiety, sickness and short tempers, when not to the safety of outright sycophancy. One consequence of this culture is that young and well qualified academics who have much to contribute to improving quality in Jaffna University are routinely shut out by abusing the selection process. Instances have been given in our cases. It has sometimes been done by a professor, vice chancellor or both telling the SAR concerned not to process an application. The SAR’s services became so indispensable in abuse of power that he has been kept on extension. A rare challenge by an applicant in the Supreme Court has revealed the University’s blatant indifference to fair play and the rule of law. Miss. Ravivathani Thuraisingam, an applicant for a teaching position in Management was turned down in an interview where the Vice Chancellor had certified the selection of another candidate after being absent for most of Ravivathani’s interview, on marks awarded using an arbitrary, highly subjective, selection scheme without legal basis. The Vice Chancellor and Dean Management have lied to the Supreme Court under oath as they had done elsewhere. JUSTA informed the Vice Chancellor about the book discussion on 17th April, which it advertised in the press on Sunday 19th. On the 20th evening USU president Thaceenthan (an archaeology special student) phoned the Science Union president about a committee meeting the next morning, which the latter did not attend. The medical union president was not told. The presidents of arts and management too, we learn, did not attend the committee meeting. A senior student counsellor holds that the letter Thaceenthan wrote to the VC as purportedly from the committee on the 21st morning is valid because the others were consulted by phone. However the other student leaders we contacted through friends contend they heard of the letter only after the BBC broadcast on the 24thnight and have for above ten days been unable to produce a copy of it, which they have been repeatedly promised. 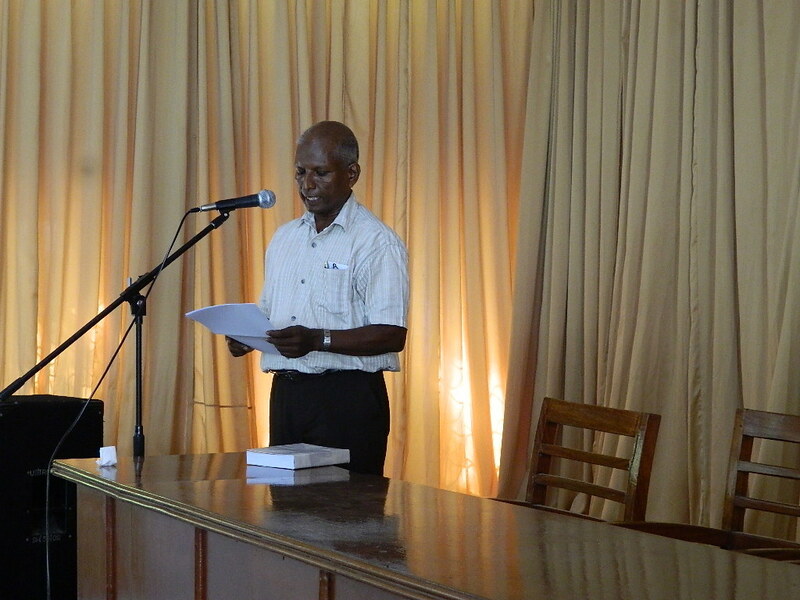 The Vice Chancellor is the patron of the USU and Mr. E. Ratnam (Marketing) is the senior treasurer. The proper channel for the letter to the VC was through Mr. E. Ratnam and university senior student counsellor Prof. Pushparatnam (Archaeology) to ensure its bona fides. The USU president says that he did not use this channel, but delivered the letter direct to the VC who promptly acted on its claims. 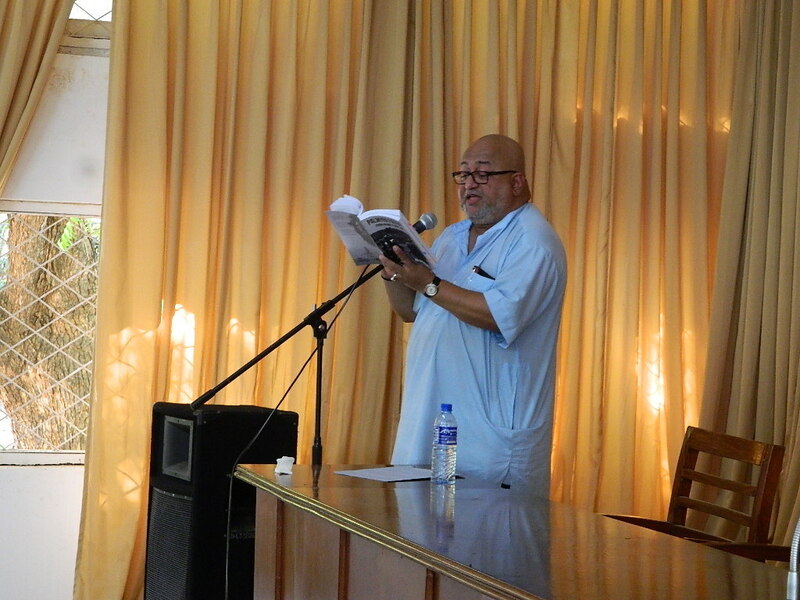 To questions from concerned fellow students and JUSTA, the USU president has been insistent that several lecturers (he once mentioned the senior treasurer) had misguided him that politicians from the South were coming for the book discussion. The USU president said he knew nothing about the book, its contents or the author. He had no proper answer to why he hurried into demanding a ban on the book discussion without consulting the JUSTA or verifying his facts. The VC read out to the deans the USU leader’s letter. While mentioning politicians with agendas coming here with the connivance of insiders, its main focus was to ban the discussion on Palmyra Fallen, which it claimed was inimical to peace. One of the deans had warned the VC not to blame them if she was banning the discussion, which she later did, as the deans’ committee had no statutory power. The sequence of events suggests that the UTA was not inducted into the banning game until the 22nd. The VC and company having issued the ban on 21st April were faced with the FUTA delegation being involved in the programmes of the 24th. On the 22nd UTA president, Mr. Rasakumaran, phoned FUTA and asked them to postpone their coming. After consultation with JUSTA, who agreed as initially arranged to run the programme for all academics willing to attend, FUTA decided to come. 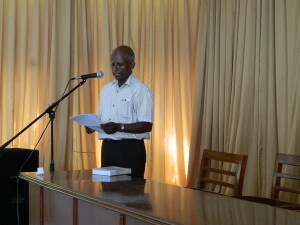 Rasakumaran then told them that UTA Jaffna will not participate in FUTA’s programme for university teachers because they were in the afternoon gracing the discussion of a book that was against Tamil nationalism. This was followed by other senior academics close to the VC trying unsuccessfully to stop FUTA. Snubbing both FUTA and JUSTA was an awkward decision for the UTA president. More awkward was the VC claiming on BBC that the UTA wanted the discussion arranged by JUSTA banned. While Rasakumaran refused to comment, a UTA committee member told us that there was no UTA committee meeting to decide on the ban. This committee member asked the secretary who told him that Rasakumaran had on his own written a letter to TNA leader Mr. Sampanthan calling for a ban on the discussion and had given a copy to the VC. When asked, Mr. Sampanthan had no recollection of such a letter and strongly hinted that the University should settle its own internal matters and not involve them. It appears from his palpable discomfort that the UTA president whose re-appointment as ELTU head awaits the VC’s decision was arm-twisted. Also, seeking re-election as fourth-time UTA president under the banner of saving Tamil nationalism (a dangerous sport in a multi-ethnic university), the choice for him, between being an honest academic and joining the ban-bandwagon, was decided. The world and times are changing and the University is under the control of a sectarian group that does not acknowledge diversity. Despite the Tamils’ decades-long opposition to the draconian Prevention of Terrorism Act (PTA), the university administration and some so-called academics have dug up their own PTA from the worst legacies of Tamil nationalism to facilitate book-banning. How out of step the University has become is reflected in its advocacy of ideologically determined censorship, when ordinary persons who have been mentally and physically maimed by our history are writing frank and harrowing accounts of the pathos, betrayal and trauma that passed under the name of liberation struggle. This is why JUSTA has held that abuses in academic recruitment must be addressed urgently and justice given immediately to the young applicants who were cheated; this could be done only by the appointment of an able and dedicated competent authority with administrative experience, who would not balk at delivering the necessary shock treatment.